Today in the Conference Coverage section of the CLL Society website, we’ve posted an interview with Dr. George Follows where he talks about the changing management of CLL and what the patient’s role is to get the best possible care. Dr. Follows chaired the session I spoke at at the European Hematology Meeting in Copenhagen in June 2016. More than a 1000 hematologists were in attendance at our pre-meeting symposium. NEW! Tuesday, November 1st at 6:30 PM at the Moffitt McKinley Outpatient Center in Tampa, FL – the first meeting of a new CLL Patient & Caregiver Support and Education Group. Patients and family caregivers are welcome. You can find more information here! Terry Evans who does a great job facilitating our founding group in Orange County, CA will be there to help launch this one. We're excited to announce that on Saturday, December 17th, in partnership with City of Hope Medical Center and the Leukemia and Lymphoma Society, the CLL Society will be hosting the second annual Post-ASH CLL Educational Forum at City of Hope. Dr. Tanya Siddiqi will be presenting on the latest data on Diagnosis and Frontline Treatment and Dr. Steven Rosen will present on Relapsed Disease and Novel Therapies. We look forward to seeing you there. I will be speaking there and sure hope you can attend. If it anything like last year's forum, it will be super. · Wednesday, November 16th at 6 PM at the Hilton Minneapolis/St. 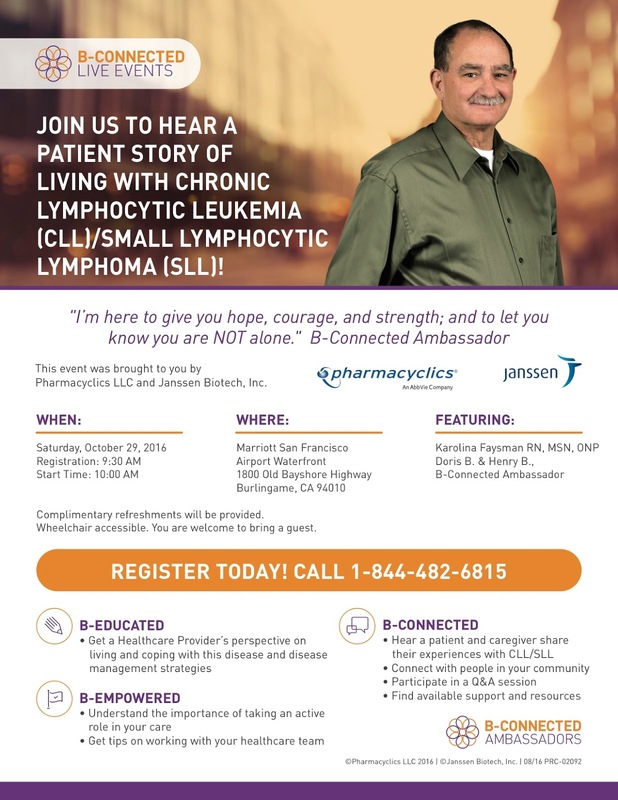 Paul Airport – Mall of America in Bloomington, MN: The Lymphoma Research Foundation will be hosting Updates on Chronic Lymphocytic Leukemia / Small Lymphocytic Lymphoma as part of their Ask the Doctor series. Dr. Timothy Call, from the Mayo Clinic is the featured speaker. You can find out more information and register here. Dinner will be served and there is no charge to attend. · Friday, November 18th from 7:30 AM to 2:15 PM at the Hilton Hotel City Avenue in Philadelphia, PA: The Abramson Cancer Center in partnership with the Leukemia and Lymphoma Society will be hosting 9th Focus on Leukemia, Lymphoma, Myeloma and Bone Marrow/Stem Cell Transplantation Conference. Dr. Anthony Mato is the featured speaker for the CLL Workshop. You can find out more information and register here. · Thursday, November 10th in Metairie, LA. More details in the flyer. Access it here. · Thursday, November 15th in Independence, OH. More details in the flyer. Access it here. · Wednesday, November 16th in Austin, TX. More details in the flyer. Access it here. I am a big believer in the importance of CLL specific support and education groups, run for and by patients and caregivers. As a result the nonprofit 501c3 CLL Society, has been active in setting up or supporting several such groups in 2016 and laying the framework for many more in 2017. We have done this by using amazing team consisting of well experienced and trained members of our local support groups, all patients themselves. I have happily handed off this important effort to my fellow CLLers, but I did reserve the meeting this Saturday, Oct 29, 2016 near the San Francisco airport to attend myself. Details are below. Click of the photo to zoom in. I will be speaking on support groups immediately following the end of the B-Connected Live Event. 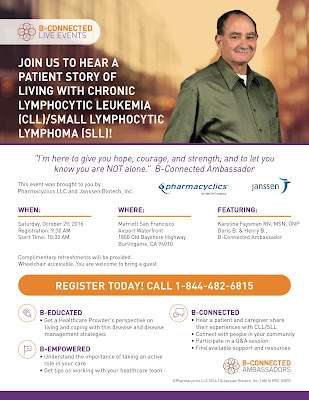 The B -Connected Events are unbranded programs and present the basics about CLL without promoting any particular drugs and also share the patient's and /or caregiver's perspective. Hope to see you there. I will be hanging around after if you want to chat. It’s all good, but it all too much. I am returning home from a very successful and delightful few days in Bethesda where I had the privilege to meet the hematology department and address the fellows and faculty about what patients want in their care when I was invited to visit the National Institute of Health. As any patients who is fortunate enough to get care at the NIH will tell you, the security to get onto the beautiful campus is tight- think TSA at the airport with sniffing dogs and x-rays and metal detectors for any car and all the passengers. But once you are in- what an amazing group of physician/scientists- brilliant caring men and women doing bench science, clinical research and direct patient care. I was so lucky to have the opportunity to share my own story and what we have learned from surveying my fellow patients. We are looking for ways to partner on research in the future. Before that I had spoken to hundreds of fellow primary care providers on gout on Saturday and geriatric anemia on Friday for certified medical education (CME). My co-presenters are wonderful educators and clinicians. It was great chemistry on stage. We worked hard to make our education relevant and real. The result was that the audience was engaged and complementary. It was great fun. Show time. One of the best parts of doing this CME again was being back with the same wonderful team that been putting on similar meetings for a decade. Last year the prospect of this happening was bleak. Due to some challenging external forces, it looked as if the end was nigh. However, through some creative and generous partnering, we are all again providing high quality accredited medical education. As one of my long time friends in the med ed world, said: The band was back together. 1. The guy who does my sound also does the Trump and Clinton rallies and when he is not making me or Donald or Hillary sound good on stage doing CME, he is also one of the soundman for the Rolling Stones. 2. On my way home from Portugal a few weeks ago, I was 3 feet away from the one and only peripatetic Mick Jagger as we were both at the same customs desk at the same time coming back into the States. He looked fabulous for a 75-year-old man about to father his 10th child. No entourage. Just one security officer. Sir Mick himself. Not one to while away my time, I also arranged several in person meetings including one with a wonderful possible development person for the CLL Society, another with one of our CLL Society directors, and another with the hardworking Betsy Dennison who handles our website and grants where we made our end of the year plans. I managed to schedule a last second telephone interview on CLL and referred two other patients for interviews that were also completed. I also serve as a director of another nonprofit company. That one accredits CME assuring that it is fair and balanced. In that capacity, I met with the chairman of our board who was attending the same conference where I spoke. We used the opportunity of being together to hold a 90-minute tête-à-tête to negotiate our ongoing mutually beneficial relationship with the two principals of med ed company that was staging the Bethesda CME meeting. I met the next day with the same folks to discuss how the CLL Society might be looped in on their future educational programs for community oncologists on CLL. We have some great plans if we can pull together the necessary resources. 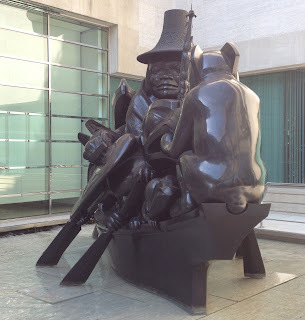 I managed to squeeze in a quick visit to the Capitol mall to see the marvelously mythical massive Bill Reid sculpture in front of the Canadian Embassy and then walked the few feet down Pennsylvania Ave. to be shocked and astonished at the Newseum. Three hours isn’t nearly enough time for a visit. Don’t miss either the Newseum or the Bill Reid. In between, daily I signed into my electronic medical records, reviewed labs, put in orders and refilled prescriptions and also talked to and sent notes to several of my family practice patients back in California. It was all wonderful- seeing old friends and colleagues and meeting new smart and caring folks with whom we might be able to forge alliances to improve the lot of CLL patients. But it is all too much. I am sharing this as the registration has been low and the meeting might be canceled. Monday, October 17th at 7:00 PM at the City of Hope in Duarte, CA. See here for more information. http://cllsociety.org/event/city-hope-cll-support-group/2016-10-17/ I will be speaking there. We are 8 weeks out from the 2016 annual meeting of the American Society of Hematology and realize that we have quite a few interviews from the ASCO and EHA meetings that have not yet been posted, so we’ll be posting twice a week until they are all out the door on the CLL Society's website. If you’re aware of other CLL Patient Support Group meetings, let us know and we’ll post them. This is really a great collection of articles written by fellow patients and doctors. Please take a look here. Did you participate in the Q1 2016 Reader Poll in The CLL Tribune? That poll focused on the factors that influence you when making decisions about your treatment for CLL. We felt that data was so important that we submitted an abstract for consideration to the American Society of Hematology. On Thursday, we heard that our abstract was accepted. While that is really exciting for us, what’s even more exciting is that the largest global hematology society felt it was important to hear the patient voice. This data is embargoed until after the meeting in December, but we will be sharing it after that. THANK YOU FOR PARTICIPATING! Your voice is important. o Could a CLL Clinical Trial Save My Life? What Were the Risks? 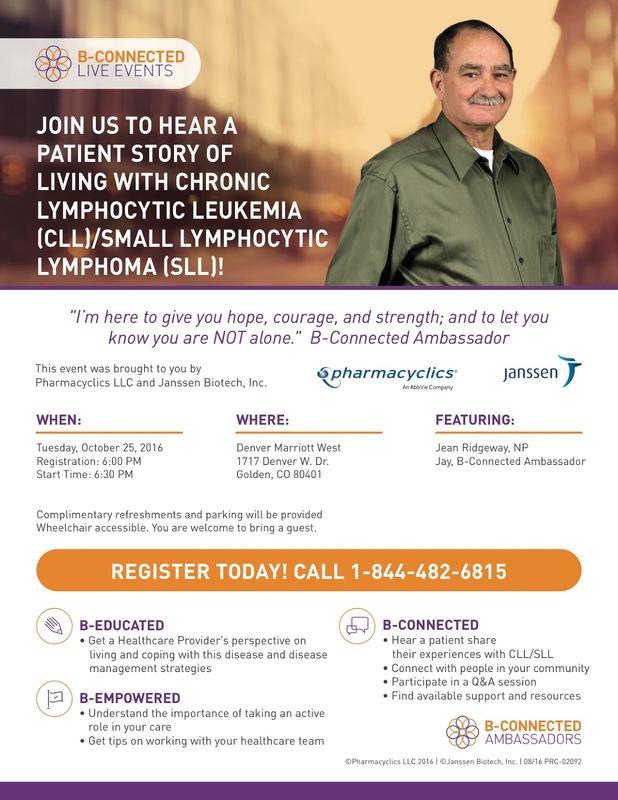 o Connect in Person: Join A Local CLL Support Group! Tonight, October 3rd in Indianapolis, IN: CLL and Indolent Blood Cancers Support Group at 6:00 PM. More information can be found here. Tomorrow night, October 4th in Tucker, GA: LLS Family Support Group at 7:00 PM. More information can be found here. Wednesday night, October 5th in San Diego, CA: UCSD CLL Support Group at 4:00 PM. More information can be found here. Tuesday, October 18th at 6:30 PM at the Levine Cancer Center in Charlotte, NC – a new CLL Patient & Caregiver Support and Education Group will be starting. Patients and family caregivers are welcome. Find out more about dates and registration here. Live in Tampa, FL? Another NEW CLL Patient & Caregiver Support and Education Group will be starting in Tampa this fall: Tentative Meeting Date November 1st at Moffitt Cancer Center. Stay tuned for details! · Saturday, October 8th at 9 AM at the Teaneck Marriott at Glenpointe: The Leukemia and Lymphoma Society will be hosting their New York/New Jersey Metropolitan Area Blood Cancer Conference. Dr. Anthony Mato from the Abramson Cancer Center, University of Pennsylvania, Philadelphia, PA will be speaking during the CLL breakout session. You can find out more information and register here. Breakfast and lunch will be served and there is no charge to attend. Parking is also complimentary. · Tuesday, October 4th in Phoenix, AZ. More details in the flyer. Access it here. · Thursday, October 6th in Park Ridge, NJ. More details in the flyer. I’ll be there. Access it here. · Tuesday, October 11th in Bloomington, MN. More details in the flyer. Access it here. · Tuesday, October 25th in Golden, CO. More details in the flyer. Access it here. · Saturday, October 29th in San Francisco, CA. More details in the flyer. I’ll be there too. Access it here.